While its too late on my conversion to get a “before conversion” noise measurement, I decided to take the “after” measurements, and this page reports the results and shows the test procedure and passes on some lessons learned with using the noise meters. 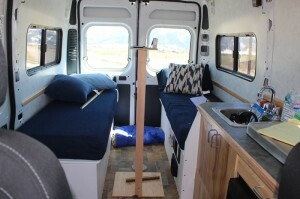 If you can do measurements on your van, that would be great — you can post the results on the ProMaster Forum or send them in to me (gary@BuildItSolar.com). 1- buy a cheap noise meter. I’ve got this one for $25 it appears to work quite well and gets lots of good reviews. 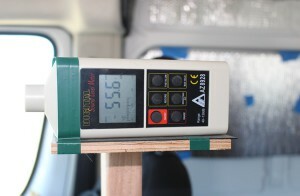 2- Make a 4 ft high support for the noise meter that you can place on the floor of the van. This could just be a 4 ft long 2 by 4 screwed to a square of plywood to serve as the base — or anything that will support the noise meter 4 ft off the floor. 3- Pick a section of road that you want to use to do the noise measuring. Maybe a mile of “average” paved road that you can easily drive the van over with noise meter before and after the conversion. 1 – Before the conversion — mount the noise meter between the driver and passenger seats on the 4 ft high pedestal with the meter 2 ft back from dashboard. 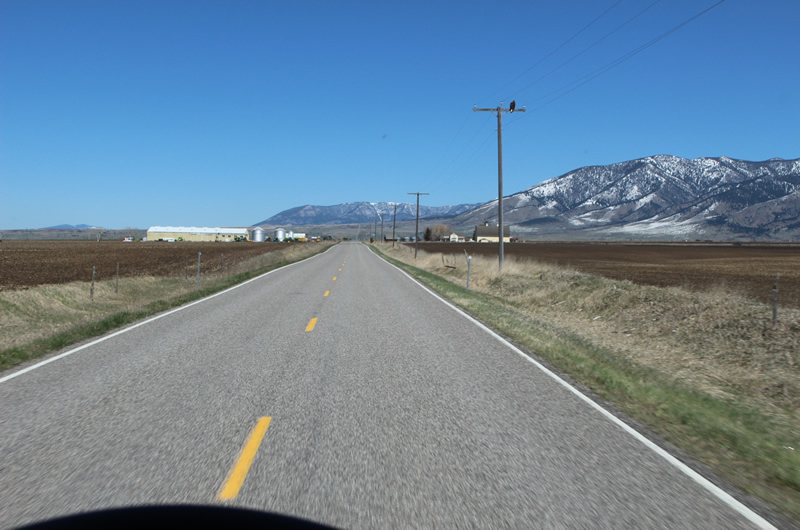 With an assistant to read the meter (or a video cam to record it) do the run on your standard road at 60 mph once in each direction. Note the weather, time of day, … anything that might influence the measurements. 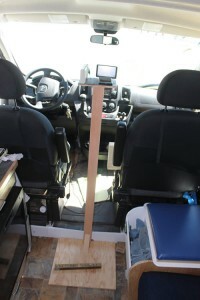 2 – Move the noise meter and pedestal to a position half way back in the cargo part of the van — e.g. half way between the back of the driver/pax seat and the rear door. Repeat the same two 60 mph runs on your standard road section. After doing the tests, I think this could be simplified a bit — see section at end. 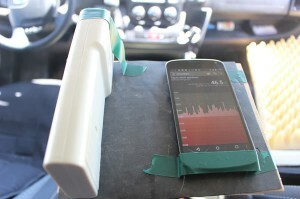 There are articles out there in which the accuracy of the smart phone noise meters has been tested against lab quality meters in a controlled environment. This is one of them: “So How Accurate Are These Smartphone Sound Measurement Apps?”, Kardous and Shaw. They looked at 130 Iphone apps and found only 3 apps were within +- 2 db of the actual values. They looked at 60 or so Android phones and these were worse than the Iphones — apparently the Iphone hardware is better suited to noise measurements than the typical Android hardware. Looking at their plot of their results, there is something like 20 db difference between the highest and lowest reading apps (and this is among the 10 apps they felt would do the best and actually tested)! It seems that with this variation between phones, that absolute noise measurements made with phones meters in our vans don’t mean much — the variation from phone to phone is larger than the noise level differences due to different treatment levels that we are looking for. But, if the levels are measured before and after conversion with the same phone and over the same road etc., then the differences may still be meaningful, and may indicate how well each treatment is doing. The pedestal in the forward (near driver ear) position. The picture makes it look like the there is an open screen on the phone but, that is the GPS screen up on the dash. Note the weight on base to keep the stand from tipping forward and make it more stable. ProMaster: radio off, windows closed, heating system fan off (this makes a difference — see below). Springhill Rd in the section used for testing. Maybe that’s an eagle on the power pole? So, the Smartphone phone meter reads about 2 db higher than the actual meter — pretty good. 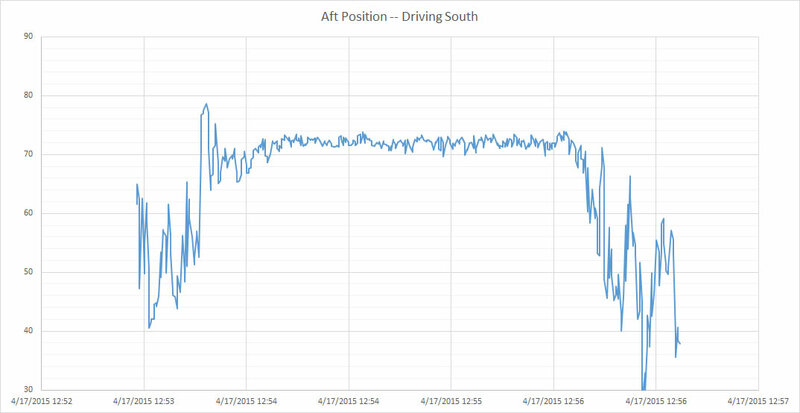 Reading on actual meter was the same — 71 db so, no difference between the North and South runs — might have been different if there had been wind. It looks like the the average noise level for the 60 mph part is 72 db — down about 1 db from the forward microphone position, but not much difference. It looks like the the average noise level for the 60 mph part is 72 db — same as the North to South run. While I find the noise level in our PM OK (you can talk and listen to the radio), its always nice to be quieter. There are a number of areas on my PM conversion that are not treated in any way — e.g. the sliding door is just bare metal. There are also lots of hard surfaces up in the cab area that could be softened. I will probably have a go at addressing some of these and seeing if we can drop the noise level a bit. 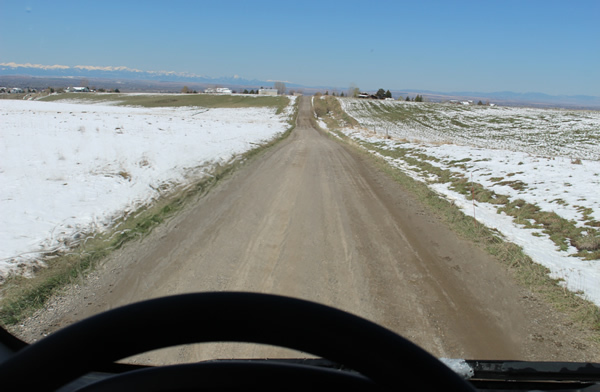 Gravel road to our house at 25 to 30 mph — 68 to 74 db — more variable than paved roads. On the standard test section of road at 60 mph — noise level 68 db — so, 3 db quieter than our PM conversion. The noise references say that 3 db is as small a change as the human ear can just barely detect, and this agrees with my perceptions — it seems to me the Pilot and the PM van are about equally noisy to ride in. Just hand hold the noise meter/phone about midway between the driver and passengers ears. I took all the measurements for the Honda Pilot this way, and it seems to work fine — the noise levels do not change much if the meters moves and inch two either way. September 8, 2015: With a few trips under our belt, we have come to feel that the noise level in the van is a bit higher than we would like, and we plan to add some additional noise treatment. 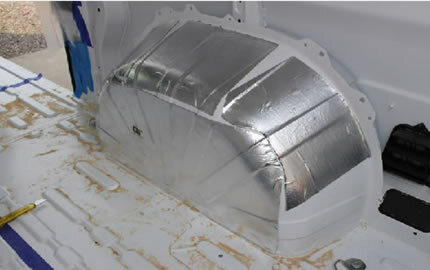 Will start with some of the untreated areas (like the sliding door), and maybe see about more noise treatment under the headliner. If I were starting the conversion over again, I’d probably pay more attention to getting more noise treatment in.